Not a big post today, just some inspiration to get you thinking about where to keep your keys so you’re not searching for them when you need to leave your house. Obviously, you can keep them in a bowl or on a plain hook, but you can also do something fun with them. 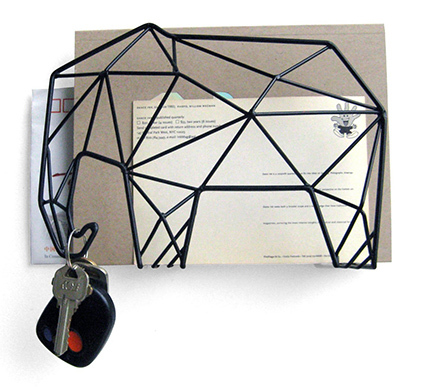 We found these two cute animal key holders on Amazon that also store mail and I think they’re super fun. Where do you put your keys? Are you in the habit of hanging them up or dropping them into the exact same spot each time you enter your home? If not, is this a routine you can easily incorporate into your life? It’s nice to know where your keys are in your house, especially in emergency situations. How well lit are your rooms? One of the things I love about my home is that all of the rooms get a lot of natural light during the day. And, each room has enough in the way of lamps and light fixtures to make them comfortable to work in at night. 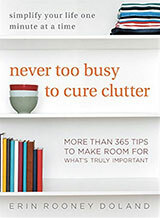 If you have a room that is dark and dreary, it’s going to work against you in your organizing efforts. You can’t see properly — and you may well find yourself avoiding the room, because it’s unpleasant. Determine what kind of light you need in your room — ambient light for sure, and possibly some task light — and then look for lighting to meet those needs. Consider what kind of light bulbs you want. LEDs are coming way down in cost, so they’re a more attractive answer than they were in the past. They last longer than other light options and require less energy to run. When I put some LEDs in my home, I bought one soft (warm) light bulb and one daylight (cool) bulb to see which I preferred, before buying more. Many LEDs are dimmable, too, which can be really nice. Rather than adding lamps or light fixtures, maybe all you need to do is replace your light bulbs. 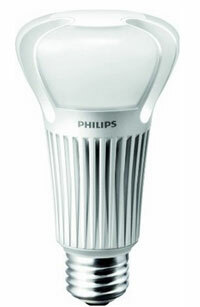 Both CFLs and LEDs allow you to get more light out of any given socket. If a socket is rated for 60 watts, for example, you can use a 13.5-watt LED light, which is the equivalent of a 75-watt incandescent, and still be totally safe. Beside the normal lighting products we all know about, there are products to address specific lighting problems, too. For example, Ikea has a battery-operated LED light for a drawer, which goes on when the drawer is opened. If the cost isn’t prohibitive, and if you aren’t facing rental restrictions, consider adding a skylight, a solar tube, or some larger windows. If possible and practical, consider trimming back plants outdoors to allow more light to enter the room. If you have good windows but privacy is an issue — so you keep the light out with widow coverings — bottom-up shades might work for you. These allow the light to come in at the top of the window. Window films might also be an option. If your home office lacks natural light and is causing problems for you and light issues aren’t easily fixable, you may want to re-evaluate where you do your office-type activities. Can rooms be re-assigned, so the home office is relocated and the darker room becomes a room where the lack of natural light is less important to you? Or could you do office-type activities somewhere else during the day? I’ve seen people do a lot of work at a kitchen or dining room table, in rooms with big windows with gorgeous views. It won’t work for everyone — some people would find the views too distracting — but it works for some. Just be careful about ergonomics if you’re working away from your normal desk. Earlier this month, our very own Jacki Hollywood Brown traveled to Germany to attend a Star Trek convention. For fans of the franchise (counting the animated series, I think it’s six shows and 12 movies), a Star Trek convention is a good amount of fun. Like most conventions, there are speakers and workshops and an expo center featuring vendors selling anything even remotely Star Trek related. 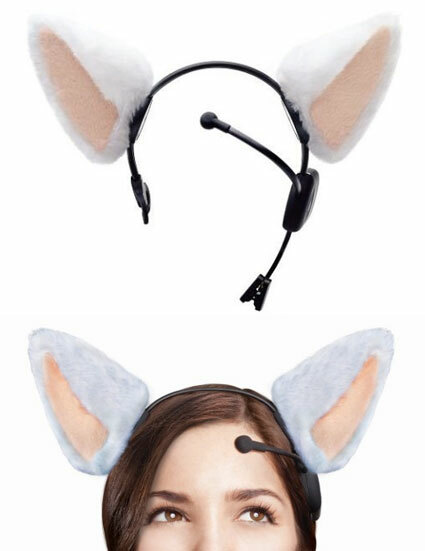 As the name implies, this is a headband with fake cat ears on it and the ears move based on your emotions. I have to be honest, I think they’re fun. However, beyond giving strangers a reason to talk to you, I’m not really sure what function they have. The whole mind reading thing is also creepy. If a headband is going to have a laser that is connected to your brain, I feel like it should do something beyond moving two little ears — like it should give you telekinetic powers or translate your thoughts into meows. Right? Plus, that giant battery pack on the left side and the laser on your forehead are certainly non-cat like and quite distracting. And, according to the Amazon reviews, they’re extremely delicate and the motors in the ears are quick to stop working (which is a bummer since the ears are $70). Are they fun? Yes. A conversation starter? Yes. A unitasker? Definitely. In Dave’s four years of working from home, he’s learned a lot about managing home and work life, staying productive while cozy at home, avoiding distractions, and more. Based on these experiences, the following are his 10 tips that keep his work on track when he’s at home. Most of us have two types of monthly bills — the big stuff and the little stuff. For the purposes of this post, I’m not talking about the big ones. I don’t mean the mortgage/rent, car payments, insurance, and so on. Those things are there and you pay them as part of your life responsibilities. No, in this case I mean the little costs, the automatic payments that are so easy to forget and that pile up quickly. You know, that $2.99 a month subscription fee or the $5.00 monthly rental fee. If we remember these at all, the temptation is to say, “Eh, it’s three bucks. I’ll deal with it next month.” Meanwhile, three becomes nine and then 12 and by the end of the year 36 — but for dozens of little things so the total is in the hundreds. Once a year, I sit down and unclutter these little payments to decide what stays and what goes. If you’re interested, the following is advice on how you can do it, too. In the example above, I’ve entered two services. First is Netflix. 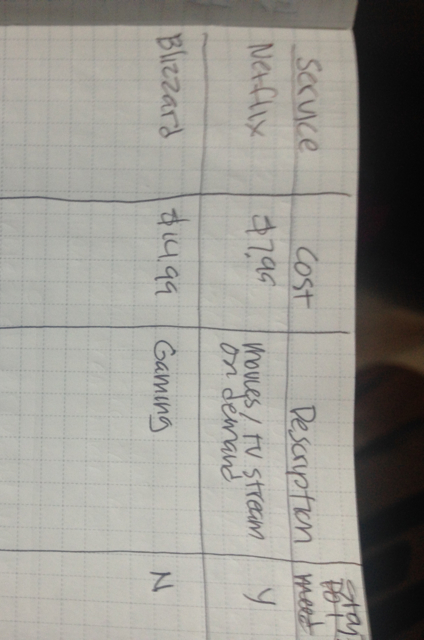 It costs me $7.99 per month to stream all the TV shows and movies I want. Is it worth it? For me, yes. My family and I spend more time watching videos on Netflix than we do on cable. For us, it’s worth it. Netflix stays. Next is Blizzard. Blizzard is a game company that lets me play World of Warcraft online for $14.99 per month. Is it worth it? Well, a few months ago, I was meeting up with several friends so that we could all play together. That was great fun, but it has fizzled out. I don’t enjoy playing solo as much. So, I nixed it. That just saved me $179.88 per year! Hooray! Before you decide if a service stays or goes, concentrate on brainstorming so you get them all down. It’s possible that you’ve completely forgotten about one (or even more). Do you have a transponder in your car that comes with a monthly fee? Do you have a safety deposit box at the bank? Does your bank charge you a monthly fee if your balance falls below a certain dollar limit? Are you renting any large pieces of equipment? Do you subscribe to magazines? Once you’ve remembered all your little costs, add up the total amount spent. It might be surprising. Once you’ve nixed the services you no longer want, you’ll feel really good about saving that money. Although it’s a little morbid to think about, having all of these subscription services written down in one place would allow for someone else to help close your accounts or suspend them in case of an emergency. Store your list in an “In case of …” file so a loved one can find it. Also, you can reference it in six months or a year to help you brainstorm all the little bills you’re paying each month. You can then replace the old list (shred it) with the new list in the file. As I said, these small monthly fees are easy to forget and tempting to overlook. This post is your prompt to unclutter them! In less than 30 minutes, you’ll have a good overview of what you’re spending, feel more on top of things, and perhaps save a little money for your trouble. Every Christmas, we receive a few jigsaw puzzles — it’s a family holiday pastime to watch movies and put the puzzles together. Interestingly enough, as I spend time going through the documents I need to prepare for our family’s 2013 income tax return, I realize that the steps involved in organizing paperwork are similar to the steps in assembling a jigsaw puzzle. Sometimes you don’t have the entire picture. Imagine only receiving one or two puzzle pieces a day. You would have to collect a few months’ worth of pieces to get an idea of what the finished project should look like. This is exactly why I have a big pile of paperwork to be sorted and filed! In our situation, living in a foreign country as visiting military, we are required to keep certain documents beyond what we would normally keep in our home country. I really didn’t know how these should be organized so my solution was to keep all of the documents in one large folder. Now that we’ve lived here for six months, we have a good idea what the “finished picture” looks like and we are able to sort the documents easily into appropriate categories. If you have a large project or one that you need a few days to complete, consider setting up in a place that has minimal impact on your day-to-day living. We assemble our jigsaw puzzle on a table in our family room, which is also the place I’ve chosen to do my filing. Consider sorting paperwork into labelled boxes. Rather than have open boxes, consider getting boxes with lids. They can then be stacked up against a wall and out of the way when you are not working. You can organize one box at a time at a later time. Decide on the “edges” of your project. Chose fewer groups with larger categories within each group. For example, if you’re working on financial paperwork, separate by decade, then by year, then within each year, then by month. You may even find that everything prior to a certain year can be immediately discarded and shredded. Do not take the “Only Handle It Once (OHIO) Rule” literally when sorting and organizing. I have never been able to take a puzzle piece out of the box, look at it once and put it into the puzzle in its exact place. Don’t expect to do it with paperwork either. Every time you handle a document, it should be to move it forward in the system of processing so that it is in its appropriate place for the next step. Not only should you prioritize it immediately, you must identify when and where the next steps take place so that the item is not forgotten either accidentally or on purpose. When we’re working on our puzzle, occasionally one of us will zoom in on an easily identifiable object within the puzzle and work on that. On our recent puzzle, my daughter found all of the pieces for a large orange flower that was in the centre of the puzzle. It allowed us to work outwards from that point to complete the puzzle faster. However, while she was working on the flower, she kept it in perspective of the entire puzzle. If you’re organizing and sorting paperwork, you may find you can easily complete a small portion of the project. You may be able to completely organize all of last year’s financial documents, for example. Congratulate yourself on a job well done but remember to zoom back out and look at the whole picture and remember what you want the final result to look like. This step is where the similarities between puzzles and paperwork end. Once all of the pieces are put into the puzzle, the puzzle is completed and there is nothing left to be done but admire the finished project. Paperwork on the other hand, increases as soon as the postman arrives the next day. Create a process to deal with all of your incoming mail. Know what to keep and what to shred. Check out some other posts on Unclutterer for tips and tricks on paper management. What’s in your digital junk drawer? Earlier this week, Jeri asked about the junk drawer that’s probably in your home (it’s okay, almost all of us have one). But junk drawers exist in places beyond your cabinets. There’s another one that’s even more covert, and it’s your computer. There’s all sorts of stuff in there, and much of it can be safely tossed away. I’ll reveal what junk is on mine and give you suggestions for how to deal with similar junk on your machine. There’s a of stuff that is, in the strictest sense, junk on my computer. These items can be thrown away with no negative consequences. For me, most of the junk is in my “Downloads” folder. That’s where my web browser places items I’ve downloaded. For many of you, the folder is probably on your desktop. For me, it’s a folder in my Home folder. To see where your browser is placing downloads, look at its settings or preferences. Then, get in there, go through what you find and delete anything that’s absolutely unnecessary. I found some true junk in my email software, too. Now I know that many of you like or even have to keep archival email. Still, instructions to the restaurant you visited three years ago is probably safe to throw away (especially if it was a lousy restaurant). Use you own good judgment when making this decision. Here’s a very popular category for a junk-drawer. I’m talking about information that doesn’t require you to do anything, but might be useful in the future. For most people, this reference material is in your email. I know that a huge number of you use your email software as a filing cabinet. I think this is a bad idea, as I explained in my very first post for Unclutterer (was that really two years ago?). If that’s you and you’re happy – perhaps you’ve got a folder system or a method of archiving/search that works – great. For me, Evernote is my digital filing system. It’s where all of my reference material lives, including user manuals. Yes, memorabilia can be digital, too. I’ve got quite a bit stashed here and there. For me, almost all of the clutter in this category lives in my photo software. You’re probably thinking, “But Dave, that’s what it’s for!” You’re right, and bravo for not piling photos on the desktop or who knows where. But, if you take as many photos as I do, your library will grow unwieldy quickly. You can keep on top of it by archiving your work. Most computers can burn discs or DVDs and it’s a nice idea to make an archive as the year ends, to be stored away. Just understand that data stored on a CD or DVD won’t last forever, so consider digital storage, too. An external drive is a good idea, as is a service like Flickr, which gives customers one terabyte of storage. A terabyte can hold a lot of photos. Flickr also lets you tag, categorize, sort and organize to your heart’s content, so that one image you need is easily found. There’s likely other stuff hanging out your computer that’s prime for more organized storage or outright disposal. Duplicates of files are certainly up for deletion. Occasionally, I’ll find a piece of software I haven’t used in ages, little notes I made while working on an article, images I no longer need and so on. It’s helpful to take an hour or so once in a while to identify and purge this temporary stuff. Now that you’ve tackled the junk drawer in the kitchen, turn you attention to the one on you’re computer. You’ll be glad you did. I have been in some disgusting public bathrooms in my lifetime. I’ve seen things I can’t unsee. I’ve smelled things I can’t unsmell. But, I’ll spare you any further details because, you know, this is a family-friendly website after all. Just believe me when I say there are some truly horrific bathrooms out in our world. For starters, these toilet covers are a dollar a piece, which seems like a lot for something you’re going to throw away after a single use. Seeing as how large they are, though, I guess you’re getting your money’s worth for the materials? 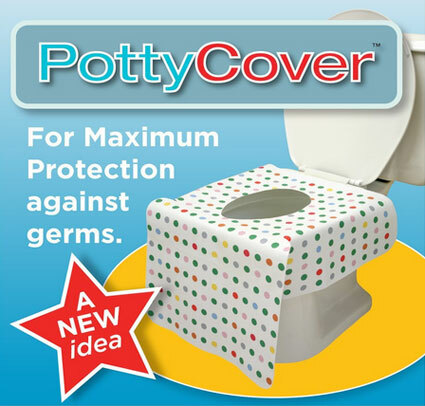 As far as these ridiculously sized PottyCovers are concerned, it’s best to save your money and just wash your hands. Many people seem to have a kitchen junk drawer, and these drawers hold a wide variety of stuff. If not in the kitchen, the drawer full of random stuff might be in a utility room or a hallway or a desk. Usually, they’re filled with a few things you need but those things could be surrounded with clutter. 6 inches of carpet tape, which is perhaps enough to use on a dollhouse area rug. Packaging and headphones for every iPhone and iPod I have ever owned, including some that are no longer in my possession. Halloween cookie cutters (I never really make shaped cookies)? If you take the time to remove the pure junk, you can then consider giving your junk drawer a new name. Laura Gaskill suggested the “really useful stuff” drawer in a post she wrote for Houzz, organizer Monica Ricci calls it the utility drawer, and Becky Harris calls it the catch-all drawer. I organized my former junk drawer a few years ago and now it’s the useful drawer. I keep markers, scissors, tape, little screwdrivers, chip clips, that rubber thing you use to open jars, and the manuals for my small appliances (rice cooker, for instance) in there. Other common things include batteries, binder clips, coins, coupons, gum, hair elastics, matches, postage stamps, reading glasses, receipts being held onto until it’s clear the items won’t need to be returned, rubber bands, sticky notes, and a tape measure. Some of that random useful stuff might better be kept somewhere else — you probably shouldn’t keep any papers in the junk drawer, for example — but that’s a personal choice. The Junk Drawer Project asks participants: “What is your fondest memory surrounding an object in your junk drawer?” The answers show that many people choose to keep bits of memorabilia in their junk drawers. Other people mentioned cards and candles, too. I started asking my friends about their junk drawers and quickly realized that the way that people curated their own junk drawer totally made sense for their personalities. I am finding that you can learn a lot about a person by way of their junk drawer. What might your junk drawer say about you? If you don’t like the answer — or if your junk drawer just isn’t working right for you any more — maybe it’s worth spending a bit of time to make a change. Organizing your personal finances can be time consuming and even a little difficult, but that doesn’t mean it’s something you shouldn’t do. The following are a few tips to help you get your personal finances organized so you can save yourself time, stress, and even money over the course of the year. By being able to see everything in one place you will be able to take control of your finances and make good decisions based on accurate information. There are several different personal finance programs available. Quicken is a very popular program for both Windows and Mac, but Quicken for Mac is only compatible with American banks. Mac users in other countries may wish to use iBank. Mint, because it is an online service, can be used on almost any computer or mobile device. However, it is currently only compatible with banks in Canada and the United States. Personal finance programs organize transactions into basic pre-defined categories but may not reflect your actual spending habits. Categories can be renamed or combined and new categories can be added depending on your lifestyle. It may take a few months of examining your transactions to determine the ideal categories for you. It is better to use a few broad topics at the beginning and then become more specific with use. After a few months of using online banking, you may choose to use sub-categories. Shopping with your debit card instead of cash allows online banking to identify in what stores you shop and will help categorize transactions. You also may choose to keep receipts to enter more information about each transaction. Do not get too detailed. If you routinely purchase groceries and household items, such as garbage bags, laundry detergent and shampoo all at the same time from the same store, consider creating a category called “Groceries, Personal and Household Supplies”. 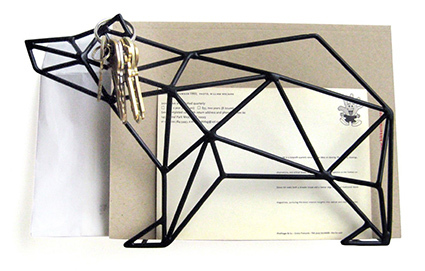 This would encompass everything that is used for your home and the people in it. Financial Charges: Many banks charge extra fees for cheques, using another bank’s automated teller machines, or making payments or withdrawals in a foreign currency. If you track this information, you can easily tell how much you’re paying in extra fees. Check the different types of accounts and banking plans offered by your bank. Switching to a different plan may help you reduce these fees. Interest Expense: It’s a bit of a shock to see how much interest is paid out on loans or bank overdrafts but it may also be the incentive you need to pay off any loans. Charitable Donations: By tracking any donations, you can easily generate a list at the end of the year that will tell you how much you have donated and from which organizations you can expect a tax receipt. It will also be easier to report this information to your country’s tax office. Reduce the number of bills you have to pay by hand. Sign up for online bill payment services when possible. If you buy things on credit (a highly debated topic here at Unclutterer), use only one or two major credit cards and cancel store credit cards. Most major credit cards have lower interest rates than store cards and great loyalty programs, including cash-back programs. Remember, just because you pay off a credit card and cut it up doesn’t mean the account is cancelled. Inform the credit card company in writing that you wish to cancel the account. Verify your credit score to ensure that the report indicates the credit card account has been closed as paid in full. You might consider bundling services where possible to reduce the number of bills you need to pay. By consolidating your various insurance policies with one company, you may be eligible for discounted premiums or other bonuses. Utility companies as well as media/communications companies provide discounts for bundling services like phone, cable, and internet access. Most utility and insurance companies offer equalized billing. By having a fixed amount to pay every month, it will be much easier to set and maintain a budget. Some companies offer a pre-authorized payment plan where the monthly amount is deducted directly from your bank account. 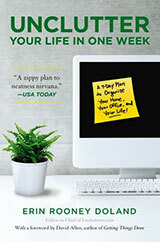 Designate certain days and times each month to manage your finances. Use this time to pay upcoming bills and update your account balances. You may wish to do your finances every Saturday morning or the first weekday after your payday. Whatever day you decide, write it down in your agenda and stick to the schedule. If you are using traditional paper billing, keep all necessary items for bill paying in one place. Fill a plastic bin/box with your chequebook, envelopes, stamps, address labels, pen, and calculator. Label the bin “BILL PAYMENTS”. You can even put your bills in the bin as soon as they arrive. Once paid, the paper bills can be stored in a filing cabinet for up to 13 months. Thirteen months is a good timeframe because it allows you to compare the current month’s totals to what they were the previous year — this is nice for things like water bills where you may be able to spot a small leak before it becomes a major one. If you opt for electronic billing download your bill/statement into a folder on your computer labelled, “Bills to Pay”. Once paid, it can be filed in its appropriate electronic folder. Ideally, the folders on your computer should mimic paper files, e.g. “Utilities – Electric”. Ensure that the bill/statement is in an easily readable format, such as a .pdf file. Whenever you receive receipts that you can use for your income taxes, such as those for charitable donations, place them in an “Income Tax” file. You won’t need to waste time searching for them come tax time. Many agencies send tax receipts via email so set up a folder on your computer’s hard drive labeled “Income Tax”. Save all electronic copies of income tax slips and receipts to this folder as soon as they arrive. Organizing financial matters takes some time and energy but you’ll reap the rewards financially and come tax time. With low-cost personal finance programs available, it is easier than ever to track your spending and make better decisions about your financial future.